Artichokes are an interesting item found in the produce section of some grocery stores. Many of us have no idea what to do with them. Yet they have been enjoyed as food since ancient times. A little know-how can go a long way when preparing these flower buds. In the video below, I cover the basics of what artichokes are, how to prepare them, cook them and enjoy them, and more. To access my video notes, please see below the video link. Enjoy! The globe artichoke (also known as French or green artichoke) is a flowering bud of a thistle plant. It is believed to be native to the Mediterranean area. We typically eat the flower buds of the plant before they come into bloom, and also the “heart” or the base of the plant. The mention of the artichoke as a garden plant goes back as far as the 8th century BC. Ancient Greeks and Romans are known to have enjoyed it as a food. Today, artichokes are grown in Europe, South America, and the United States, with California producing almost all of the artichokes consumed in this country. Artichokes are an excellent source of fiber, vitamin C, folate, magnesium. They are also good source of vitamin B complex, vitamin K, vitamin E, calcium, iron, phosphorus, potassium, sodium and zinc. Artichokes also contain high levels of antioxidants, so they are VERY healthful vegetables to eat! Choose artichokes that are heavy for their size, with bright green leaves, and tightly compacted leaves. Avoid those with discolored or brown-tipped leaves or with a dried brown stem. The smaller heads are more tender than larger ones. Store unwashed artichokes in the refrigerator in a plastic bag. They should keep for about a week. Artichokes can be frozen. But, they should not be frozen raw since they will become discolored and have a poor flavor when cooked. To prepare them for freezing, remove all of the outer leaves and the fuzzy choke, leaving the pale, inner leaves attached to the base or heart. Trim the tops and stems. Wash the hearts in cold water and drain well. Blanch the trimmed artichokes in a mixture of 1/2 cup lemon juice or 1 tablespoon of ascorbic acid to 2 quarts water. Boil small artichokes for 3 to 5 minutes, and medium sized artichokes for 7 minutes. Place face down on a towel to drain. Placed the drained pieces on cookie sheets, face-side up, in the freezer until fully frozen. Once frozen, place desired portions into suitable containers and return to the freezer. Steamed artichokes can also be wrapped in foil, placed in plastic bags and frozen whole. Frozen artichokes should keep for 6 to 8 months. To thaw artichokes, remove them from the freezer and wrap them tightly in aluminum foil. Place the artichokes in foil over steaming water until thawed and cook as desired. More people eat the tender artichoke hearts than those who eat the leaves. This makes frozen and canned artichoke hearts excellent, convenient choices. Choosing canned or frozen artichoke hearts can save money and time in the kitchen, and is often the preferred way to enjoy artichokes. First peel away the loose petals at the base by the stem. Cut the stem away at the base of the artichoke, leaving about one-fourth of an inch. Trim the top points by cutting away an inch from the top to expose the inner part of the petals. Use kitchen shears to trim the thorns from the outer petals. Rinse under cold, running water to remove any trapped dirt or debris, or soak briefly in a bowl of lukewarm water. Allow them to drain upside down on a towel to remove trapped water. Rub a cut lemon half against the trimmed parts of the artichoke or place them in a bowl of lemon juice with water to prevent browning. To boil, place trimmed whole artichokes in a deep pot and fully submerge in cold water seasoned with 1 tablespoon of salt, 1 tablespoon of lemon juice and 2 of your favorite fresh herb sprigs like thyme or basil [optional]. Boil artichokes for 30 to 40 minutes, depending on their size, just until tender. They are done when you can insert a sharp knife with little pressure. To steam, place trimmed whole artichokes on a steaming insert in a pot filled with water barely touching the bottom of the insert. Steam for about 45 minutes, or until you can easily pull away a petal from the base. Depending on size, cooking times will vary. To roast, after trimming, slice artichokes vertically in half. Use a spoon to scrape out the fuzzy choke, rub the cut side with half a lemon, drizzle with olive oil and season with garlic powder, salt and pepper. Roast at 375ºF cut side down on a baking sheet until tender, about 30 to 40 minutes. Serve cut side up with grated Parmesan cheese. To grill, after trimming sliced artichokes in half vertically, remove the fuzzy choke and submerge in a bowl of water mixed with the juice of a lemon. This will keep artichokes from turning brown while you prep the remaining other ones. Bring a large pot of water to a boil, add artichokes. Boil for about 15 minutes, or until slightly firm. Remove from the pot and drain. Drizzle with olive oil, more lemon juice, garlic powder, salt and pepper and finish on the grill, cooking for 5 to 10 minutes, while turning the artichokes often to prevent burning. To microwave, after trimming place whole artichokes in a microwavable baking dish with enough water to almost submerge and cover. Microwave on high for 20 to 30 minutes until tender. Cooking times may vary based on microwave and size of artichoke. To enjoy, remove the pedals of the artichoke and arrange them around your favorite dip. Meanwhile, prepare the heart of the artichoke by twisting off the small tender inner leaves to reveal the soft, fuzzy but inedible choke. Use a spoon to scrape out the choke to reveal the soft fleshy base of the artichoke known as the “heart”. Serve with melted butter as a side dish. Artichokes are served as a hot vegetable often with a sauce or as a cold salad or appetizer. To eat it, break off the leaves and slide a leaf between your teeth to remove the softer edible portion. •	Use melted butter, garlic butter, or hollandaise as a dipping sauce for hot artichokes. •	Blend artichoke hearts with sautéed spinach, sour cream, cream cheese and parmesan cheese to make a dip for pita chips or your favorite cracker. •	Add artichoke hearts to a grilled cheese sandwich or pizza, or stuff them for an impressive and beautiful dish. •	Toss artichoke hearts, celery and parmesan together for a modern update on a regular green salad. •	Here’s an inspired idea: deep fry artichoke leaves in beer batter and serve with a creamy, herb dipping sauce. 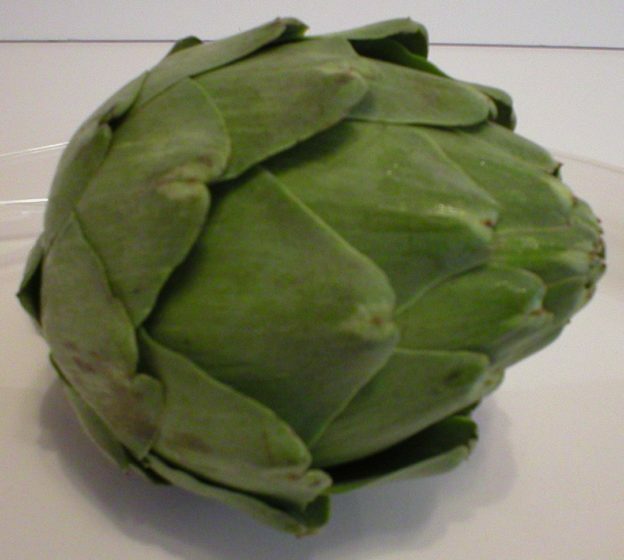 This entry was posted in Food and tagged about artichokes, artichoke recipes, artichokes 101 the basics, how to prepare artichokes, what to do with artichokes, why do artichokes turn brown on April 11, 2019 by Judi.